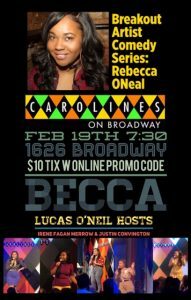 ThoughtGallery.org > Rebecca O’Neal (Netflix) Headlines Carolines on Broadway | Free w Email RSVP! Rebecca O’Neal (Netflix) Headlines Carolines on Broadway | Free w Email RSVP! Justin Covington! (Netflix)Rebecca O’Neal does an extended 45+ minute set hosted by and featuring some of her favorite comics from NY & Chicago!